The Getting To Know (G2K) Collection offers a pioneering approach to producing and performing classic, beloved musicals with elementary, middle and junior high school students and youth theatre performers. 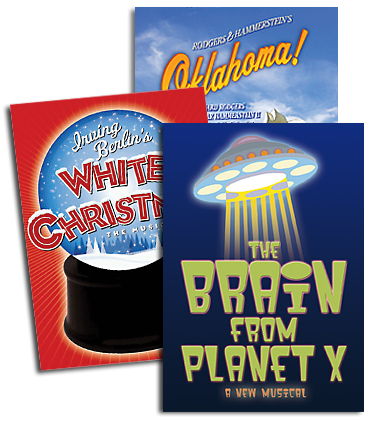 Elementary and Middle/Junior High Schools, please email Hal Leonard to license your production: gettingtoknow@halleonard.com. All other groups, please call R&H Theatricals: (800) 400-8160. Consisting of 50-70 minute versions, that maintain the essence and story of the full-length work, the musicals encompassed in the Getting To Know Collection are expertly designed and developed to offer young people the opportunity to experience musical theatre by providing teachers and theatre professionals with age-appropriate, education-based, easy-to-use adaptations of the best of Musical Theatre. Study Guide, providing lesson plans and exercises based on the show, to help integrate the production into a school curriculum. The adaptations currently available in the Getting to Know Collection are the renowned musicals THE KING AND I , OKLAHOMA!, CINDERELLA, and ONCE UPON A MATTRESS. The response to the Getting To Know Collection has been phenomenal. Teachers, administrators, youth theatre directors and parents are discovering firsthand how participation in the Getting To Know Collection sparks a young person’s imagination, builds their communication skills and instills a sense of discipline, responsibility and dedication. By introducing kids to musical theater, you foster their burgeoning talents and build a lifelong appreciation for musicals and develop the audiences of tomorrow. As anyone who has ever been involved in a musical, onstage or off, will tell you, it is an exhilarating experience you never forget. Elementary and Middle/Jr. High Schools, please email: gettingtoknow@halleonard.com, or visit halleonard.com for more information. Youth Theatre and other Organizations, please call R&H Theatricals: (800) 400-8160. I have found Hal Leonard/R&H very difficult to work with on Getting to Know You. For example if you search for Oklahoma...you would not find the G&K version. You type in G&K and get nothing. You have to type in "Getting" in the search engine. I stumbled across G & K State Fair completely by accident. Then I wanted to try to order perusal copies. I had to fill out the whole application on R&H before it sent it back and told me to go to Hal L. I wanted to order a perusal script, and the only thing listed is a sample CD so I had to call Hal L. They told me the cd includes a script. Why can't the description just say that? Also the listing here on R&H doesn't include a complete listing. Do they not want to sell these? I am confused as to why there is a $150 deposit required for the G2K shows, as the showkits are not necessary to return to R&H. Also, I am disappointed that even though it states in the contract that materials may be shipped 10 days after full payment is received, that you have to pay extra if that date is more than 8 weeks before your showdate. Our children's theatre actors only rehearse once a week for 10 weeks, so we have to pay extra to get our materials on time even though we've paid in advance. We love the R&H shows, but wish these issues could be better explained or corrected if necessary. Thank you. What a disappointing website. I was excited to find a great G&H show to do with my kids but navigating this site is ridiculous. Maybe I am biased, but I think there is a big market for big shows that are re-written to be useful for middle schools. I get the opinion from R&H that they are not very interested in the middle school market. Four shows? Really? From the incredible library of R&H they come up with four shows for middle schools. And then make it a royal pain to find them and get info about the measly four shows? Weak effort.